The Canberra Times is paying much more attention to Australia’s Got Talent than I’d ever want to over the exclusion in strange circumstances of Canberra’s Owen Campbell from the Grand Final. Only reason to watch gone. These shows are rotten to their very core but A lot of good has certainly come out of Owen’s wild ride. UPDATE 12/07/12 13:33: Meanwhile Mr Campbell is up to number 9 on the ARIA album charts, ahead of Cold Chisel, Gotye, and Crowded House! 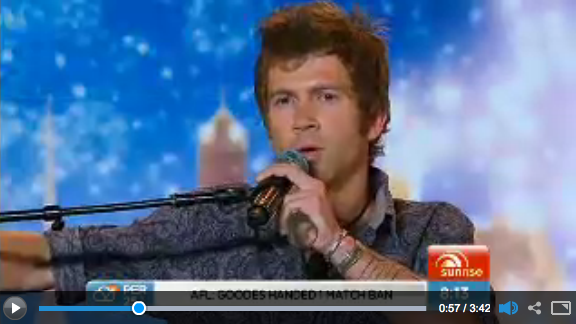 For some reason we can’t locate any other AGT entrants there in the top 20. Interesting approach to running a ‘talent’ show. Althought the presence of that Kylie guy ensured I would never watch it anyway. Still makes me laugh & laugh hard! !